The Green Party today announced a game-changing plan for public transport in New Zealand, with free fares on buses, trains and commuter ferries for all young people around the country, as well as a commitment to fund and build a congestion-free network in Auckland. The Green Card will provide universal, 24/7, free public transport for everyone under the age of 19, and free off-peak public transport for tertiary students at university, polytechnic, wānanga, private training establishments, and people training through apprenticeships. All people with a disability on the supported living benefit will also be eligible for free public transport. "The cost of transport shouldn't be a barrier to getting to class or going on a family outing," said Green Party transport spokesperson Julie Anne Genter. "We can make public transport free for young people for the cost of just 1 km of one of National's motorways. "We hear from families that the cost of public transport is too high and it forces them to drive, causing pollution and adding to traffic, or stay home. The Green Party will fix that so Kiwis can travel around our cities cheaply and cleanly. "Average weekly transport costs for families are $40 more now than they were just four years ago, and take up 15 percent of an average household budget. "Thirty-six percent of morning rush hour traffic is school traffic. Making it easier and more affordable for kids to catch buses and trains will make a big difference to unclogging our roads. "The Green Card will cost $70 to $80 million each year and will be funded from the Land Transport Fund. This will allow councils to invest more of their own funds to further improve public transport services. 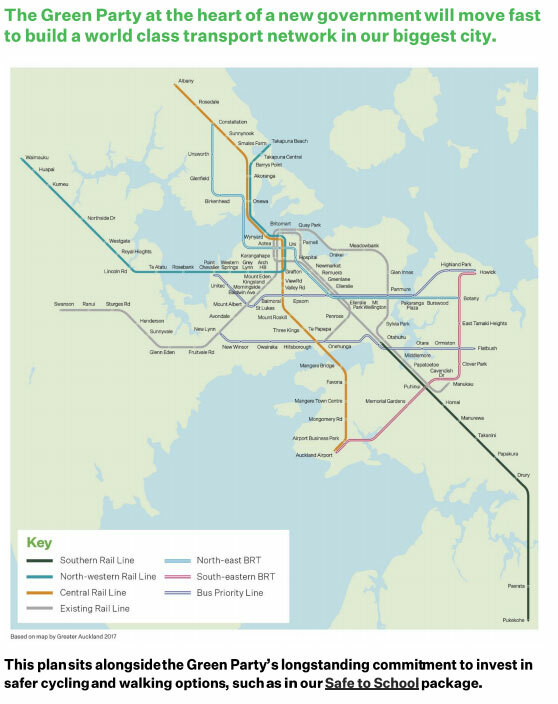 "In addition, the Green Party is committing today to building a congestion-free public transport network in Auckland over the next decade, including light rail to the airport by 2021, a new North-Western light rail line, and beginning work on rail to Albany on the North Shore by 2030. "Building the congestion-free network will be funded by reallocating existing low-value and non-urgent transport spending. "We support allowing Auckland to raise a regional fuel tax. We will also work with Auckland Council to investigate part-funding some projects through land value capture. "The Green Party will announce more transport policies for other parts of New Zealand before the election," said Ms Genter.